All right, after a brief introduction, we are introduced to the concept of esoteric implements; In case you’re not familiar with the idea, here goes: Basically, they capitalize on the amazing roleplaying potential ingrained in the occultist class (easily one of my favorite classes, btw.) – implements, per default, can be exchanged, but ostensibly are supposed to have some deeper narrative meaning/connection. This is not only a great adventuring catalyst, it also allows groups and GMs to generate meaning and mythology and ultimately represents one of my favorite concepts in Occult Adventure’s class design, one that has been overlooked by quite a few folks since the occultist, as presented, is less flashy than his brethren. But I digress: Esoteric implements, as depicted herein, would hence be special implements that grant specific powers when invested with mental focus. As such, the items herein do come with brief background stories as well as prices, construction requirements, etc. Basically, these are items that represent specialist replacement resonant powers and as such. Blur the line between item and class option. We get a total of 4 such esoteric implements herein, the first of which would be Gorduin’s Obscuring Cap, which is particularly useful to those with the illusion implement school; mirroring the former wearer, an assassin overexposed to illusions, the cap grants occultists with that school of at least 7th level the ability to form a blanket guise that may conceal a whole array of magic items from detection´, though this is a resonant power that replaces distortion. Furthermore, at 9th level, with at least 6 focus invested, the wearer can gain the benefits of misdirection. The Hypnotizing Pendant was once worn by a failed bard, who used her powers to convince the audience she was any good; as such, it is an implement for occultists with the enchantment implement school. The power is also unlocked at 7th level, though this time around, it is a focus power and lets the occultist duplicate either hypnotism or lock gaze via mental focus expenditure, with higher levels yielding more targets affected. Slightly weird, but only on an aesthetic level: While unlocked at 7th level, the determining level for more targets s based on 6th, which may be an anomaly or a minor hiccup. Power-wise, I don’t mind the presentation as such and the rules are intact. Revenge of the Unknown Mercenary would be a robe for occultists with the necromancy implement school; it is the robe of a mercenary’s soul, fused with his fabrics during a horrid expedition into the negative energy plane; as such, it should surprise no one that it is a necromancy implement. The required level for the power would be 9th. The robe grants the focus power to expend 1 point of mental focus as a standard action to grant yourself a shroud of negative energy, which bestows a temporary negative level on those unlucky enough to hit you with melee or natural attacks. The negative level lasts 24 hours, the activation of the power 1 minute or until it is discharged thus, at which point it requires another activation to replenish. 13th level provides the option to activate it as a move or standard action. Finally, there would be the Dangersight Goggles, which sport a bit of a weird inconsistency: They are obviously intended for divination specialists (7th level requirement), representing the semi-sentient goggles of an ascended samsaran, but they note enchantment implement school as a prerequisite. (The correct school is noted in construction requirements. )(Also: The focus power they grant is formatted in italics, when it should have its name bolded.) The focus power granted is pretty brutal: Expend 1 point of mental focus for +1/2 occultist level to initiative when rolling it…or act in a surprise round in which you usually wouldn’t be able to act as though you rolled a 1, excluding all bonuses and penalties. After the surprise round, you get to properly roll initiative. The powers are mutually exclusive, since the implement has a 1-minute cooldown. This implement can be *very* potent in PF’s gameplay and should get close GM-scrutiny; initiative boosts can be very, very potent…particularly in mythic gameplay. Personally, I’d increase the cost of the item’s use…particularly since its flavor mentions wearers over-relying on it…sounds like me like a cool angle to nerf this, which is just what I’ll do. Editing and formatting, for the most part, are very good. As noted, the final item has a few minor hiccups, one of which can cause a bit of confusion. Layout adheres to the printer-friendly two-column standard of the series and the pdf sports a nice full-color artwork. The pdf has no bookmarks, but needs none at this length. Jen McTeague’s esoteric implements are fun,. 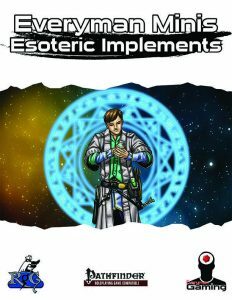 Interesting and left me wanting more; while the minor hiccups in the final one detract a bit from the pdf, I ultimately still consider it to be a great and inspiring resource for occultists and GMs alike; in fact, I’d love to see a bigger book (or more minis!) that provide such unique implements; sky and creativity are basically the limits here! All in all, a mini worth getting, which is why my final verdict will be 4.5 stars, rounded up for the purpose of this platform.